Brighton Festival guest director 2019 unveiled! Brighton Festival has named Malian singer, songwriter and multi-instrumentalist Rokia Traoré as its 2019 guest director. She follows in the footsteps of David Shrigley (2018), Kate Tempest (2017) and Laurie Anderson (2016) among others. Regarded as one of Africa’s most inventive musicians, Rokia Traoré is known for the variety and range of her practice. With her work rooted in the Malian musical tradition, her unique sound and liberating style have led her to be described as one of the world's great synthesisers. Andrew Comben, chief executive of Brighton Festival, said: “She is a remarkable artist who deserves to be recognised for the great breadth and range of her output – from her theatre work with Toni Morrison and Peter Sellars to her musical collaborations with Damon Albarn and the Kronos Quartet. Born in Mali to a diplomat father, Rokia had a nomadic upbringing that exposed her to a wide variety of international musical influences from Ella Fitzgerald, Billie Holiday and Louis Armstrong, to Wagner, Serge Gainsbourg, and the Rolling Stones. A protégé of the legendary guitarist Ali Farka Touré, Rokia’s breakthrough came in 1997 when she was hailed as the ‘African Revelation’ by Radio France Internationale. 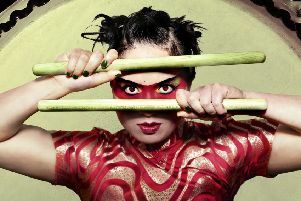 Frequently collaborating with world-renowned artists such as Damon Albarn, Devendra Banhart and the Kronos Quartet, Rokia’s diverse output has also included a number of theatre performances, most notably the acclaimed Desdemona by Toni Morrison, a reimagining of Shakespeare’s Othello directed by Peter Sellars. A dedicated humanitarian, in 2009 she set up the Foundation Passerelle in support of emerging artists amidst the social crises in Mali. Other programme highlights revealed so far include Brighton Festival Commission and world premiere of a new choral work about motherhood and childhood created by theatre-maker Sheila Hill, Eye to Eye, featuring an intergenerational chorus of women and children recruited by Glyndebourne and featuring Glyndebourne Youth Opera; and a new commission, True Copy, based on the story of legendary Dutch painter and art forger Geert Jan Jansen by BERLIN, the international theatre company behind former Brighton Festival events Perhaps All the Dragons (2014), Land’s End (2012), and Zvizdal (2016). The full programme will be released in February.